Hopping around the globe as a suitcase entrepreneur, running your own business while exploring new cultures and meeting new people, is the dream of a growing number of people around the world. “How to become location independent?” is the topic of many courses, ebooks and blog posts out there. But what do digital nomads really struggle with most once they’ve hit the road? Of course productivity plays a big role, as does finding new clients or running a sustainable business on the road. 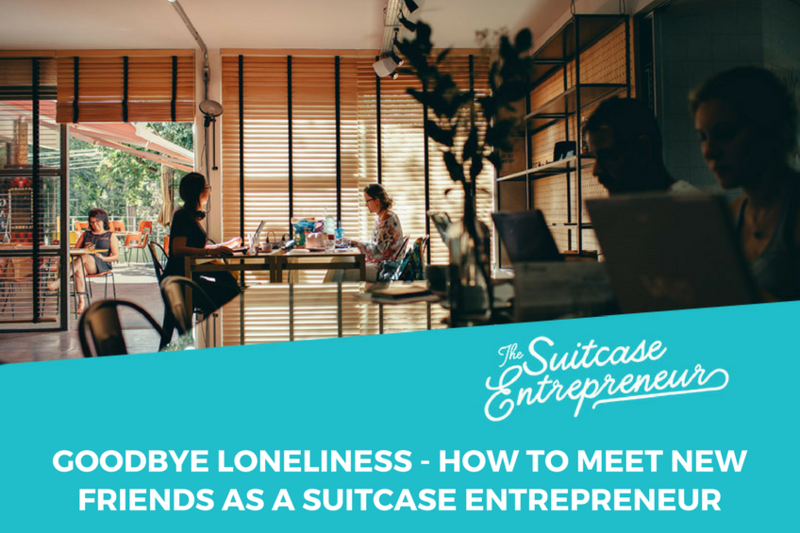 However, one of the biggest issues faced by suitcase entrepreneurs, which is rarely mentioned in glamorous Instagram shots or envy-inducing blog posts, is loneliness. Why is loneliness such a problem for nomads? Traditionally, friendships are formed based on proximity. When you’re young, you make friends with kids in your neighbourhood or your class. In university, you tend to make friends with classmates and roommates. And the same goes for coworkers when you enter the working world. However, the fleeting nature of location independence means that we can no longer rely on proximity as the basis for relationships. When you’re moving regularly and have a full-time remote job or business to run at the same time, it can be tricky to meet people, and even trickier to form deep and lasting friendships. Paradoxically, this challenging lifestyle requires a strong support network, making it easy to run out of steam when both exploring the globe and running a business by yourself. Thankfully, the internet has bypassed the need for proximity to meet people. Now we can make friends from all over the world through shared interests. Whether it’s our love for the same farm-animal-based iPhone game, a shared cause or passion, our connections can cast a wider net, which is incredible. As digital nomads, we can benefit from this by leveraging online networks, like Facebook Groups, Meetup and specific forums, to meet other location independent people. Personal relationships aren’t the only connections that digital nomad have to put effort into – we also have to actively build and foster a professional network. A survey of new members of my Facebook group, Digital Nomad Girls, showed that the number one reason for joining is to connect with other digital nomads to make friends and form business relationships. Location-based, nomad-specific Facebook groups are popping up in towns and cities all over the world. A simple Facebook search of ‘your location + digital nomad’ should bring up at least one active Facebook group that you can join to meet others already on the ground. I always join groups before I move to a new location to start building connections and ask any questions I might have about my soon-to-be home. While Facebook groups and forums are a great start, the sheer size of many communities makes it hard to get to know people well. That’s why paid virtual communities and membership sites are becoming increasingly popular. Many of these subscription-based communities are centred around a business topic, but more are beginning to offer accountability, virtual coworking days that allow you to chat with real people during work breaks, and a network that travels with you when you’re on the road. 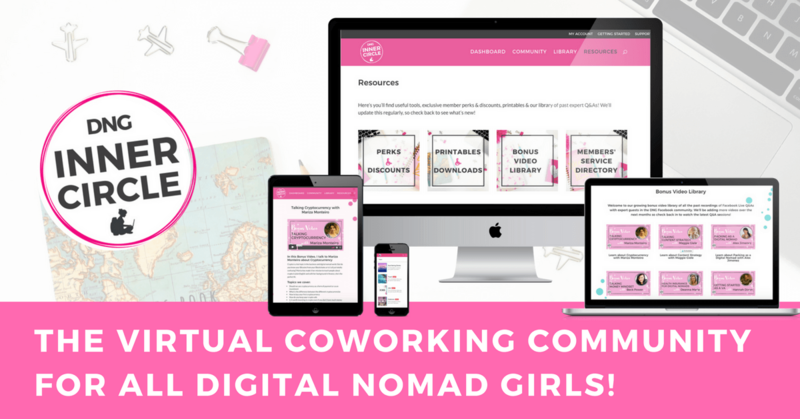 I run my own virtual coworking community for digital nomad girls, called the DNG Inner Circle, where we meet regularly for Live Q&As, expert hours, virtual coworking, and goal setting sessions. It’s a great addition to an in-person network because it travels with you wherever you go, allowing you to continue getting to know other members even after you’ve moved to a new destination. Online connections are great and necessary for digital nomads. But, although they can supplement real, in-person friendships, they can’t replace them. Nothing beats meeting up with a friend face-to-face for a drink, meal, movie, or maybe even an adventure. One of the best ways to meet other remote workers and digital nomads in a new destination is to work from a coworking space. Coworking spaces are shared offices that allow you to rent a desk for a day, week or month. Many coworking spaces offer free trial days, which is a great way to check out different spaces in a city, meet new people, and find out which have built strong communities. Read Natalie’s post on Is Co-Working the Cure for Entrepreneurial Loneliness? Here in Las Palmas, Gran Canaria, a city of around 350,000 people, there are at least 10 coworking spaces. Yet not all have nurtured community as well as others. ReStation, the space I often work from, organises 4 (!) weekly events, including a mastermind session, group breakfast, group lunch, and a nomad coffee club with guest speakers. I recommend checking out a few spaces to find the right one for you. It’s not all about wifi and coffee, although they are a necessity, but about the quality of connections you will make. It’s not very inspiring to go to an office without getting to meet people. If you want to take it to the next level, you can look for co-living spaces, which are popping up in cities worldwide. These shared accommodations are grown-up versions of hostels, but with great wifi instead of the wild parties. Staying at a co-living space can be a great way to meet people, especially if you’re just staying for a short time or if you’re looking to settle long-term and need a base while searching for long-term accommodation. Digital Nomad meetups can now be found in many cities, and are often a great way to get introduced to many people at once. However, as often the case with networking events, you can come away feeling like you’ve had the same conversation over and over without talking to anyone on a deeper level. We all know the triad of nomad introductory questions – “Where are you from? What do you do? Where are you going next? – the inevitability of which can leave us craving deeper conversations and deeper connection than small talk about shared travel routes or wifi connection can satisfy. Authentic relating nights are cropping up all over as an answer to our need to connect on a deeper level. At these events, strangers gather in a friendly setting where a host runs a number of authentic relating games, which aim to skip the small talk and dive right into deeper conversation. These events allow you to get to know others on a different level than would be possible at a regular meetup or networking event. One example of these games is called “Anybody Else?”. All participants sit in a circle with one person in the middle who shares something from their life, for example “I have a difficult relationship with my mother”, followed by “anybody else?”. Anyone in the circle who relates to this statement stands up, and one is selected to make the next statement. You can play these games on whichever level is comfortable for you – you could share something funny (“I have a fetish for muppet costumes”) or serious (“I used to be the loneliest person I knew”) – but the aim is to break the ice and connect beyond the shared interests of travel and online business. I played this game at the 7in7 conference in Barcelona last year and loved it. I have met many digital nomads that dislike nomad-centered meetups because a love of travel and location independence isn’t necessarily enough common ground to base a friendship on. Let’s face it, who doesn’t love travelling? And just because you’re making a living online, doesn’t mean you’ll connect on other topics. That’s why it can be great to meet people outside of the regular digital nomad scene, or look for other common interests beyond location independence. Pursue your other interests and hobbies while travelling. Are you into hula hooping, acro yoga, or knitting? Great! Find a local group and join in. If you’re in a country where you don’t speak the language, find out if there are regular language exchange events. These are usually free and open to anyone who’d like to practice their language skills in exchange for helping locals with their English. It’s a great way to make local friends and to practice a new language. Volunteer for a local cause or project you support. This is usually easier if you’re staying somewhere longer term, but volunteering is a great way to learn about local issues and gain deeper insight into culture and add value to the local community. Sports have always been a great way to meet people, and it’s no different for suitcase entrepreneurs. Find out if there are local meetups for your favourite sport, or be adventurous and try something new. In Latin countries, salsa meetups are popular and a great way to meet people for a fun night out. If you’re in a beach destination, check for beach volleyball meetups or yoga classes. The range of new events targeted at location independent entrepreneurs and remote workers popping up around the world just shows how many digital nomads crave connection with like-minded people. In particular, new digital nomads are flocking to organised trips like Remote Year, Wanderist Life, and Unsettled. For a flat fee of around $2000-2500 per month, these companies organise accommodation, coworking spaces and travel between locations, as well as regular events and activities. You can also travel across oceans with 250 other digital nomads on Nomad Cruise, experience the Trans-Siberian railway on Nomad Train, or enjoy coworking and meet hundreds of nomads at dedicated conferences like 7in7 and DNX. Some people love these programmes because all the logistics are taken care of, while others miss the flexibility of self-organised travel. If connecting with other digital nomads is important to you, then choosing a popular nomad hotspot might be a great idea. Besides Chiang Mai in Thailand (the current digital nomad Mecca), Bali in Indonesia, Las Palmas in Spain, and Medellin in Colombia are some of the most popular digital nomad destinations. Coworking spaces are abundant and meetups, dinners, and events are organised almost daily. While it’s easy to meet other suitcase entrepreneurs in these hotspots, many are just passing through, and it can be frustrating to meet someone and click with them only to say goodbye a few days or weeks later. I’ve caught myself thinking “Oh, this person seems really nice, but they’re only here for five days, so it’s probably not worth getting to know them”. The best way to avoid getting jaded like this is to base yourself in one location for a longer period. Many digital nomads adjust their travel style and pace to accommodate longer term friendships. They stay in one destination for months instead of weeks, often using one city as a home base from which to explore and travel. This is one of the easiest ways to maintain a regular community and circle of friends while enjoying the freedom to travel while working. Another benefit of slow travel is that you can integrate better into a local community and get to know it on a different level than you’d be able to if you were just passing through. more effort into meeting new friends than you might have been used to at home. The good news is, as this movement grows and more people become location independent, there will be more communities, events, and opportunities to connect with like-minded people. What are your favourite ways to meet other suitcase entrepreneurs? PS. Pick up a copy of The Suitcase Entrepreneur book for more tips – available in both bookstores and online. 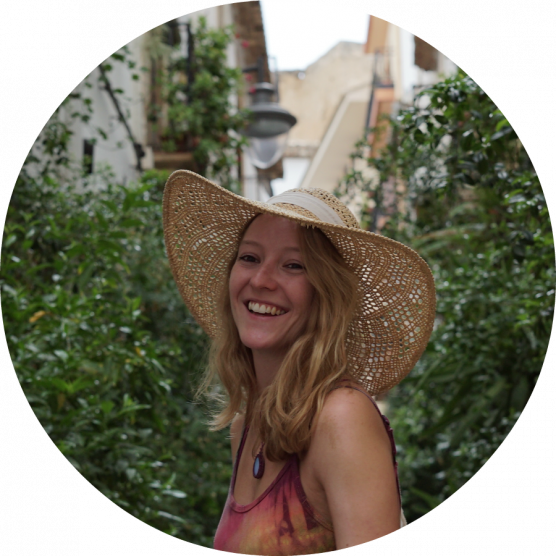 Jenny Lachs is a former scientist turned freelance writer and the founder of Digital Nomad Girls, a community for location independent women around the world. She has made it her mission to connect, inspire and empower other nomad girls and foster community online and offline through her virtual coworking community, the DNG Inner Circle, and mastermind retreats in Europe and beyond.